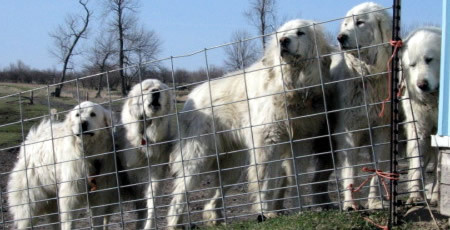 At Foot Flats Farm we use Pyrenees/Maremma guard dogs to protect our flock from predation. Our dogs are raised with the sheep and once put to work, come to identify with the herd and guard it as their job. They bond with the flock and stand guard over it, barking and behaving aggressively to deter predators. We currently graze on around 900 acres, some of which is up to six km from the farm - this would be impossible without the extensive use of our guard dogs. Ten years ago we were skeptical of how guard dogs might work – today we can’t imagine our operation without them. We raise a litter of pups each year, which bond with sheep as soon as they become mobile. 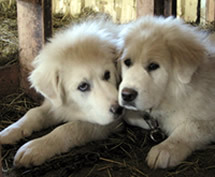 Pups are for sale at eight weeks of age and older. Semi-trained or fully trained dogs may also be available. Contact us for availability and pricing. 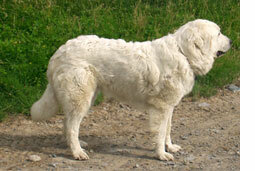 One of our original guard dogs, “Varden”, now has over 30 descendants protecting flocks across Ontario and in the northeastern United States. Conservatively, the family must be saving at least 300 animals from the coyotes each year, let alone the stress and injury saved in flocks. In the winter the island is linked to the mainland by ice and for up to three month the coyotes travel regularly on and off the island. Inevitably we are left with a resident coyote population each year when the ice goes out. Potential predation pressure seems to vary a little each year and we think depends on factors such as overall coyote population, individuals (some individuals or groups appear to be much more aggressive on livestock) and natural prey base. Over the years we have noticed a “honeymoon period” – for the first one or two years after a block is newly fenced with electric fence, the coyotes appear to be wary and do not bother the sheep. However in year two or three the problems will start. Increasingly the coyotes appear to hunt more in family groups or packs. A friend of ours has actually witnessed this – a guard dog was lured away by a coyote whilst its friend or friends attacked and killed sheep at the other end of the field. We now find we have to run guard dogs in pairs or even groups of three or four in the larger fields. Barker, Valley, Owen, Titch and Varden - five of Foot Flats' adult guard dogs. All the land that we own is now fenced with a coyote deterrent fence. The first 65acres were fenced over 10 years ago as a wildlife damage control project with the Ontario Soil and Crop Improvement Association. Since that time we have leveraged Environmental Farm Plan money to fence our 300 acres and have had no coyote losses to date in this area. Descriptions of this project, the costs of fencing, and the costs of maintaining guard dogs can be found on the OSCIA website. The OSMA website has a video describing the construction of the fence for a presentation at the Peterborough Predation Conference in 2013.